The Eurozone seems to have temporarily averted a serious sovereign debt crisis in its periphery – which had the potential to quickly spread from Greece to Portugal to Spain and possibly even wider afield and to morph into a full-blown banking and financial crisis – with a nearly 750 billion euro bail-out plan. The plan requires European governments to commit about 500 billion euros for emergency loans through a special purpose vehicle (SPV), the IMF to promise another 250 billion euros if the need arises, countries receiving emergency loans to agree to harsh “austerity measures” and the European Central Bank to agree to purchase bonds of member countries. With the real fear of contagion spreading across the Atlantic, the US Federal Reserve has reopened swap lines to provide dollar funding to European banks, again, if needed. Will these extraordinary set of measures be adequate to the task of dealing with the crisis? The answer is not at all clear. There are reports that credit markets in Europe have started tightening up, especially in the periphery, with small businesses taking the first hit. The average cost of borrowing dollars in Europe (usually done by banks) has started inching up; the spread between the three month dollar LIBOR (London Interbank Offered Rate) and the Overnight Indexed Swap (OIS) rate has also risen over the last few weeks, providing tell tale signs of growing stress in financial markets. Financial markets around the world tumbled on May 20 amid fears that not only will the Eurozone debt crisis not be “solved” by the bail-out package but will instead spread to the US and halt the fragile recovery currently underway. Things are moving fast and it is difficult to arrive at a conclusive answer at this point, but the debt crisis in Europe might very well be the start of the next phase of the global structural crisis of capitalism that started in 2007 in the US. While it would be interesting, and possibly even useful, to speculate on the future path of the European, and US, economies, in this article I would like to focus on some other, but related, questions. How did the sovereign debt crisis in the Eurozone area come to pass? What are the underlying causes of the crisis? What are the possible exit routes? Who bears the costs of adjustment? To set the ball rolling, let us quickly go over the sequence of crucial events. The sovereign debt crisis in the European periphery started in October 2009 when it came to light that the budget deficit of the Greek government was much higher than what had been previously reported, both in the press and in government documents. Figures for the Greek budget deficit were rapidly revised upwards to about 13 percent of GDP, much higher than the 3.7 percent figure released earlier in the year. By the beginning of 2010 it became clear that government statistics were highly unreliable and that there had been deliberate attempts to massage the books, drawing inspiration perhaps from the now infamous examples of Enron and Lehman Brothers. What was especially striking was the heavy involvement of sophisticated Wall Street investment banks like Goldman Sachs in assisting the Greece government fudge its accounts with the use of complex financial instruments. With a large budget deficit and a mounting sovereign debt, ratings agencies like Standard & Poor’s downgraded Greek government debt, first in late 2009 and then in April 2010 to junk bond status. The yield and credit default swap (CDS) rates on Greek government bonds increased rapidly, reflecting financial market participants’ expectations of an increased probability of default. Interest rates increased, increasing the debt burden even further, thereby worsening matters for Greece. 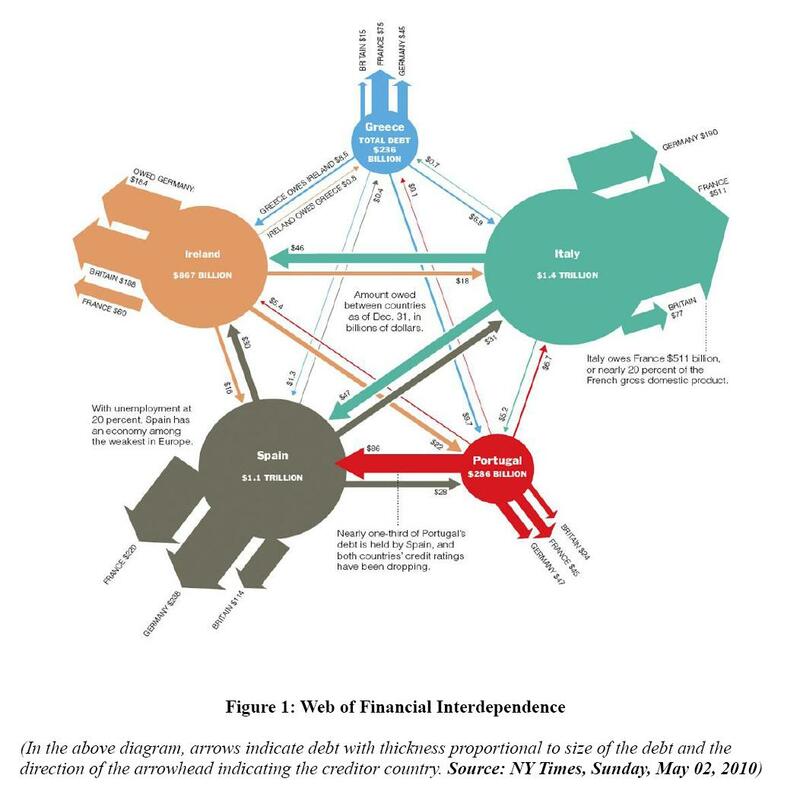 Because of the complex web of financial interdependence among the countries in the Eurozone area (see Figure 1), and especially the countries in the so-called European periphery, real fears of contagion spread rapidly through European financial markets. Bond markets in Portugal, Spain, Ireland and even Italy were badly hit, with Spain’s government debt downgraded. What caused this crisis in the European periphery? From a macroeconomic perspective, there seems to have been two major causes behind the current build-up of sovereign debt in the European periphery: (a) the dynamics of Germany’s growth process in the 2000s, and (b) the loss of policy options, for the countries in the European periphery, resulting from participation in the European Monetary Union (EMU). Let us investigate each of these in turn. Germany is the largest economy in the EMU – accounting for about a quarter of its GDP – and its growth process is bound to have profound impacts on the European periphery. In the 2000s, Germany’s growth was fueled not by internal demand but by running persistent trade surpluses with the rest of the world, including countries in the European periphery. Sluggish or non-existent real wage growth, enforced by a strong German neoliberal regime, hampered growth of aggregate demand and kept inflation rates low. Low inflation in the context of a monetary union meant high real interest rates in Germany and, going hand in hand with low aggregate demand growth, had a negative impact on private investment expenditure. But, the slow real wage growth relative to countries in the European periphery, at the same time, gave Germany a competitive advantage in the internal markets of the periphery countries. Recall that the raison d’etre of the monetary union was the closer integration of the economies through the unfettered cross-border movement of goods, services, capital and labour. German firms took full advantage of this integration; building on the advantage of lower wage growth, they moved in to capture markets in the periphery; the persistent trade surplus of the German economy largely drove its GDP growth through the 2000s. But persistent German trade surpluses meant persistent trade deficits for its trading partners, including some of the countries of the European periphery; this feature of the German growth process gave rise to severe and persistent imbalances in the countries of the Eurozone. Right through the 2000s, countries like Greece, Portugal, Spain, and Italy were forced to accept huge and growing current account deficits (see Figure 2). But how were the persistent deficits financed? Along expected lines and following the logic of financial integration entailed by a monetary union, a large part of the government budget deficit in the periphery was financed by capital outflows from Germany (and France); large financial institutions emerged as major players in the market for government debt in the European periphery. The structural imbalance at the heart of the monetary union, whereby Germany’s growth is supported by persistent trade surpluses, which in turn finances persistent trade deficits in the periphery, therefore seems to be one of the most basic causes of the current sovereign debt crisis in Europe. The second cause of the current crisis is the severe loss of policy options of the countries in the periphery due to their participation in the EMU. Being part of a monetary union with a common currency, countries in the periphery have lost two crucial policy tools: (a) exchange rate policy, and (b) monetary policy (understood either as the ability to set key short-term interest rates or to control some measure of the quantity of money, however measured, in the aggregate economy). Thus, faced with a growing trade deficit, countries like Greece, Portugal, Ireland, Italy and Spain could not devalue to stem the tide; neither could they tamper with interest rates to deal with the recession and high official unemployment rates that came with the global economic crisis of 2007. Thus, while the export-oriented German growth process, leading to a severe and persistent trade imbalance in the countries of the EMU, contributed to the build-up of sovereign debt in the European periphery, participation in the EMU by these same countries severely restricted their ability to deal with the imbalance. Thus when the global economic crisis of 2007 hit these economies as massive negative demand shocks, leading to precipitous fall in export earnings, the underlying decade-long structural imbalance was rapidly augmented by an accelerating trade deficit. Attempts by the government’s in the peripheral countries to counter some of the adverse impacts of the global recession with stimulus spending and falling tax revenues due to the recession, increased the already high deficits even further. The result was the build-up towards the sovereign debt crisis that Europe is currently reeling under. How could the current crisis be resolved? Without dismantling the monetary union, there are two broad ways to deal with the crisis, one that imposes the lion’s share of the cost of adjustment on the working class of the European periphery, and the other that ensures that part of the cost to be borne by European finance capital as well. It is therefore obvious, given the differential distribution of the costs of adjustment across social classes, that the balance of class forces will ultimately decide which is chosen. The first option, the one favored by European finance capital, is to advance emergency loans to Greece, and if necessary to the other countries too, and enforce Structural Adjustment Program (SAP)-type conditionalities. The logic behind this option – roughly what has been adopted with the 750 billion euro bail-out package – is as follows: loans will allow Greece to continue to service its debts (most of which is owed to banks and other financial institutions in Germany, France, and other advanced capitalist countries) so that bondholders do not incur any losses. The conditionalities – reduction of government spending on social sectors, freezing of public sector jobs, reduction in wages, privatisation of the pensions sector, labour market reform, tax increases, and other such measures – will serve two related purposes. (3) First, it will severely contract the level of aggregate demand in the Greek economy and thereby push it into a prolonged and deep recession; this will ensure a disinflation or even a deflation in the Greek economy relative to Germany, leading to a possible reduction in the Greek trade deficit. (4) This is how, in this option, the basic imbalance in the EMU will be addressed. Second, since a crisis always opens up channels to alter the balance of class forces, this occasion will be used to weaken the European working class further – by pushing up unemployment rates to historically unprecedented high levels – and push through a slew of neoliberal reforms like privatisation of pensions, education, health care and insurance. All in all, this option will bail-out financial interests and impose the costs of adjustment on the working people. It is not clear whether this option will work even on its own terms. Most realistic assessments of the situation assert the necessity of debt-restructuring; the question is not whether it will take place but when and at what terms. Additionally, the deeply recessionary implications of the “austerity measures” will, in all probability, slow down the whole eurozone economy and militate against efforts to get the core countries of global capitalism growing again. The second option, the one that should be favored by the working class in Greece and other countries, including Germany, is to work out a sensible debt-restructuring program with bondholders and force the German economy to reflate. The logic behind this option is as follows: debt-restructuring would ensure that some of the cost of re-adjustment is borne by finance capital, the same finance capital that had recklessly lent to the periphery when profits were flowing, the same finance capital which helped the Greek government massage its books. Increasing aggregate demand in the German economy through a mix of fiscal and monetary policy would revive aggregate demand, push up inflation, drive down real interest rates and thereby boost private investment expenditures; through the multiplier, this would lead to robust output growth. The resultant inflation, in the German economy, relative to the countries in the periphery, would increase the German real exchange rate, reducing its trade surplus thereby addressing the basic imbalance in the EMU. (5) The growth is aggregate demand and output can, in turn, allow real wage growth, something in the interests of the German working class reeling under the burden of neoliberalism. This option, therefore, has the potential to forge an alliance between the working classes of the European periphery and the center. Thus, while the first option addresses the basic cause of the crisis – the persistent trade imbalances in the countries of the European periphery – by forcing a painful deflation in the periphery, the second option addresses the same issue by enforcing, instead, a reflation of the German economy, the largest constituent of the EMU. The secondary problem of sovereign debt is addressed, in the second option, by a sensible re-structuring program to avoid financial chaos and contagion, while in the first option that problem is ignored altogether. On both counts, the second option is, therefore, what the working class should push for even when the first is presented, with a 750 billion euro bail-out package and adequate media support, as a fait accompli. Of course, other options will open up if Greece and other countries in the periphery decide to opt out of the eurozone altogether. Acknowledgement: I would like to thank Debarshi Das and David Kotz for helpful comments. (1) As a matter of ex post identity, the budget deficit (BD) is the sum of (a) the difference between private sector savings (S) and investment (I) and (b) the trade deficit (TD), i.e., BD = (S-I) + TD; thus, an increase in the trade deficit, with the savings-investment gap remaining unchanged, will contribute to an increasing budget deficit possibly through a reduction in tax revenues and increase in government welfare expenditures. (2) Spain, as is well known, had witnessed a massive property bubble financed by capital flows from Germany; hence, in the case of Spain, the savings-investment gap was fed by the current account deficit while the government’s budget deficit remained relatively small until the beginning of the global economic crisis of 2007. (5) If the inflation spreads to the countries of the periphery it might even reduce the debt burden in real terms and help in efforts to deal with the debt problem.